Traditionally, EasyJet has competed with other budget airliners such as Ryanair and FlyBe. Their new campaign however, has taken aim at British Airways, signalling a change of approach. What does YouGov BrandIndex data tell us about how successful this strategy has been? In recent months, EasyJet launched a new Ad Campaign. The advert is a in a way a homage to Alice in Wonderland, featuring a white rabbit and the song ‘I’m late’. The focus is on punctuality, with the claim put forward that on average, EasyJet were more punctual than British Airways across Europe last year. The strapline is ‘That’s business sense’. The last part illuminates EasyJet’s target audience. It knows that many business travellers have traded down to cheaper airlines post-recession. Highlighting reliability and punctuality, they hope to convince such passengers that they will not lose out travelling with the airline. If we look at YouGov BrandIndex’s Ad Awareness metric, we can see that it has at the very least, proved memorable to viewers. From early September to mid-October, the percentage of people that said they had seen the advert rose considerably, reaching a high point of 21.6. 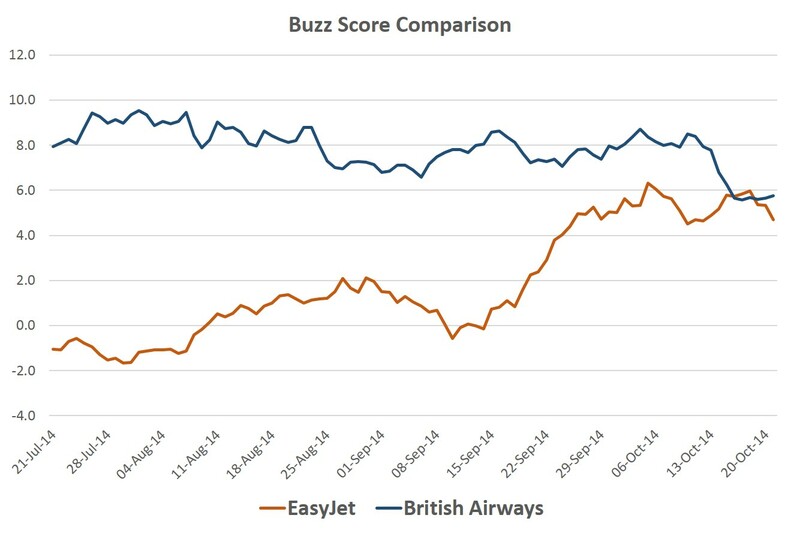 During this increase, EasyJet’s score rose noticeably above the level achieved by British Airways. More generally, it has been a period of increased popularity for EasyJet. Innovations such as becoming the first airline in Europe to allow passengers to check in by taking a picture of their passport in a new app feature, has created positive press for the brand. 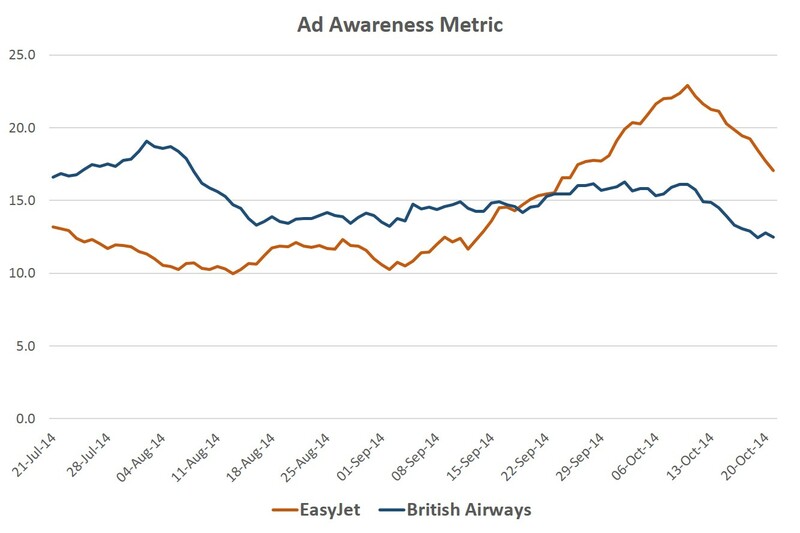 Our Buzz Metric is particularly revealing in this respect and confirmed the good news for EasyJet. As recently as last week, EasyJet overtook British Airways for the first time in months in our Buzz rating (although BA have moved slightly ahead again at the time of writing). In fact, EasyJet’s score rose from a modest -1.7 at the end of July, to a much more satisfying +6.0 mid-way through October. Conversely, during the same period, British Airway’s score moved from a high point of X to a low point of +5.6. So, we can reasonably conclude that EasyJet’s strategy, twinned with their marketing efforts, is having an effect on consumers. They have breached the gap between themselves and British Airways in our buzz metric. They will be hoping this translates into a long term trend which signals that they can compete with airlines that traditionally were not direct rivals.